A new version of firmware software OS, collectively known as iOS but previously known as iPhone OS, has been released by Apple for iPhone 3G, iPhone 3GS, iPhone 4, and iPod touch 2nd, 3rd and 4th generations. 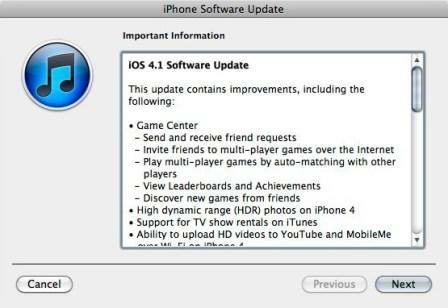 The new iOS version 4.1 includes several bug fixes and features enhancements such as implementation of Game Center, fix for iPhone 4 proximity sensor, improvement of iPhone 3G performance, HD video upload over Wi-Fi to YouTube or MobileMe, TV show rentals, and support for High Dynamic Range (HDR) photos on iPhone 4. Game Center allows players and gamers to keep track of game scores, challenge friends or play multiple-player games online with auto-matching capability against another player. iOS 4.1 also includes change introduced in iOS 4.0.1 that improves the formula to calculate signal strength bars due to iPhone poor antenna reception issue. iPhone, iPad and iPod touch users can get the latest updates by simply plugging and connecting the iOS device to computer, and then download and install the latest version of iOS through iTunes. IOS devices owners who want to perform manual upgrade or downgrade, or simply want to save a copy of the iOS software can download the iOS 4.1 with the following direct download links from official Apple server. The first generation iPhone (iPhone 2G) has to continue to use iPhone OS (iOS) 3.1.3, while iPad will only be upgraded to iOS 4.2, where its current firmware version is iOS v3.2.2.